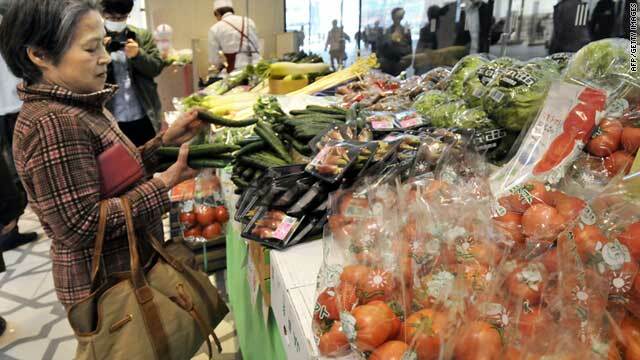 A shopper looks at vegetables for sale, grown in Ibaraki, Chiba, Tochigi and Gunma prefectures on April 6, 2011. (CNN) -- Japan's government has lifted restrictions on vegetables and milk from some parts of the country's north after inspections found radiation levels below legal limits for three straight weeks, a top government official announced Friday. The move lifts a ban on spinach and kakina, another leafy green vegetable, from Gunma Prefecture, southwest of the quake-damaged Fukushima Daiichi nuclear power plant. Milk from the Aizu area of Fukushima Prefecture, inland from the plant, will also be allowed for sale, Chief Cabinet Secretary Yukio Edano told reporters. "The level of radiation has stayed low for last three samplings," said Edano, the government's point man for the nuclear crisis. What does radiation exposure mean? The government has slapped bans on a variety of farm products products grown or produced around the plant, which has spewed radioactive particles into the sky and water since the March 11 earthquake and tsunami that knocked out its coolant systems. Workers are still battling to keep three damaged reactors at the plant from overheating four weeks later. Radiation levels have been trending downward in the area around the plant since mid-March, according to data released by government ministries. And farmers have been pushing Japanese authorities to lower standards on radiation in food, calling them excessively stringent and not necessary to protect consumers. Edano said Monday that the government's legal standards would not be changed, but food would be allowed for sale if it passed three weekly tests.